If you’re grinding and sanding without a dust mask, you’ll end up spending less time doing what you love and more time coughing. Wood particles might not be harmful on the outside, but when inhaled in larger quantities, it can cause damage to your lungs over time. Learn more about the best dust mask for woodworking below. This dust mask is an excellent choice for people that are looking for something lightweight and portable. It is great for a wide variety of outdoor activities. This would be the ideal dust mask for things like mountain biking, lawn mowing, or other activities that require emit dust and debris. It is also useful during flu season. It features a new and improved air flow valve that makes breathing with a mask on a more comfortable experience. The new and improved airflow valve reduces heat and humidity build up inside of the mask. The mask its self is reusable and the filters can easily be exchanged and replace when they become worn out. The materials that are used to construct this dust mask are nylon and spandex. These materials allow the mask to be lightweight, comfortable and form fitting around the face. It features an adjustable tightness strap which allows for a customizable fit. The strap also works to prevent the mask from slipping, which is important if you are using the dust mask for outdoor activities like biking where you may not have access to your hands to adjust the mask. This dust mask is scientifically proven to isolate and block 98% of dust and other related materials from passing through the filter. If you have a serious need to filter out dust and other debris from your airway than this could be the dust mask for you. This activated carbon dust mask features an adjustable Velcro strap which makes fitting the dust mask easy and convenient. It is designed to fit behind the ears, rather than pressing down on them, which adds an extra level of comfort. This activated carbon dust mask features a lightweight and adjustable nose clip for added convenience and comfort while wearing this dust mask. This feature works to prevent the dust mask from sliding. 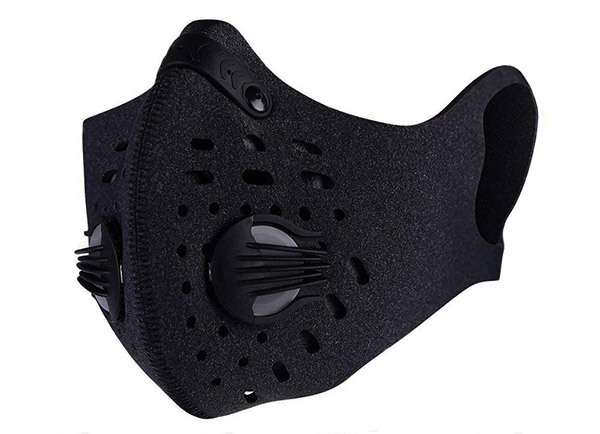 This activated carbon dust mask features a new and improved “easy breath” ventilation system which makes it easier to breathe out of this mask. It features double the number of air valves compared to previous models made by this company, which makes fresh air exchange while wearing the mask easier. The filter on this mask is easy to replace and the mask comes with easy to follow instructions for doing so. This mask comes in four different colors and is sleek and stylish in design (as stylish as you can get when it comes to dust masks). They are made out of a material that is soft to the touch and feels on the skin. This dust mask fits well over the nose and mouth without having to worry about making constant adjustments to prevent the mask from slipping. The mask features a “military grade” filtration system. The air valve on this dust mask opens and closes automatically when inhaling and exhaling which makes breathing in and out of the mask a comfortable and smooth experience. This dust mask is machine washable and can be reused time and time again. All this is required is that you change out the filter when it becomes worn. This mask is an excellent choice for people that have allergies. It not only filters out dust but does a great job of removing pollen and other particles in the air that can trigger allergies. This mask does a better job than disposable masks do but is still lightweight enough to be comfortable to wear. If you have to wear a dust mask on a regular basis, investing in this reusable mask could be a great idea. If you’re looking for the best dust mask for your line of work, remember to replace your filters after they’re used up. Especially when woodworking, dust filters can clog and defeat its purpose. Remember to pair your dust mask with a high-quality set of safety goggles!